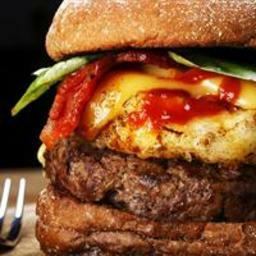 If desired, serve burgers with cheese, letuce, tomato, onion, and pickes. They were okay. Placing the BBQ sauce while cooking took away from the BBQ FLAVOR. it would have probably tasted better if served warm and used like a dunking sauce on the side. Amazing taste! Nice and juicy. I made this with just the hamburgers and sauce and added grated cheddar on the top after grilling. Even though I made them on an oven, they turned out pretty good. I love the sauce! I usually don't grill... Ever. This was absolutely phenomenal. Fantastic flavor and simple to prepare. Lots of flavor and easy to prepare! BBQ sauce was pretty basic but combined well with the charcoal flavor. Ours came out juicy and flavorful! This was not anything I couldn't make with a bottle of BBQ sauce. I make my own BBQ sauce and it's much better. Family liked and would do again. We only eat all organic products so I dont know how this would taste otherwise, but I can tell you this is the best BBQ Burger that I have ever had in my life! This was an incredible burger! Tried these tonight. I did add 3 cloves of garlic rather than one but then my wife and I both love garlic. Her comment was these are excellent. I will be making them again.